here and winter is now far behind. Hello once again everybody! Welcome to another edition of Whispers, the newsletter of the Dereila Nature Inn - your cyber nature centre where we celebrate nature and photography every month with trivia, tips and site updates. Once again we'd like to thank everyone for subscribing, contributing and supporting our project. We've got some new features to tell you about this month as well as the usual sections which we hope you'll enjoy. Here's this month's trivia question: Which creature's name was derived from the French words meaning spiny pig? This month we have another puzzle for you to solve. Do you know what this close-up picture is? Here are the latest features at the Inn which we hope you'll enjoy. Our latest interactive crossword features birds that have red, reddish or orange coloured features. Meet a Goose-necked Moss, Palm Tree Moss and Stair Step moss as well as over two dozen other mosses in our latest at At-A-Glance Guide. lichens are a fascinating field of study. We've updated and expanded our guide which now includes over 60 different species. Each month we invite you to submit nature photographs to this part of our newsletter. 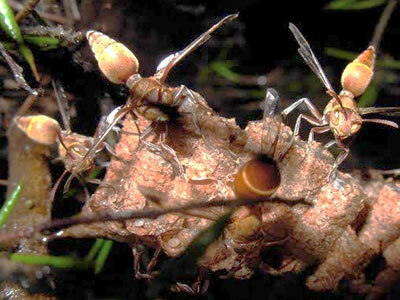 Julia F. from Kanuela, HI sent in this wonderful picture of some interesting looking wasps. It was taken while on vacation in Pretoria, South Africa. Rob Walker from Victoria BC sent us some more of his great underwater photographs. 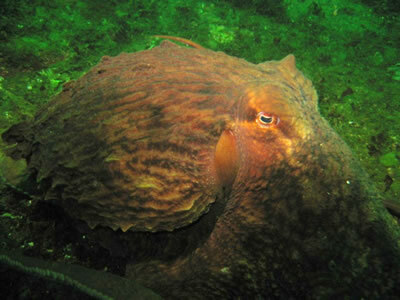 This is a Giant Pacific Octopus, Octopus dolfleini. 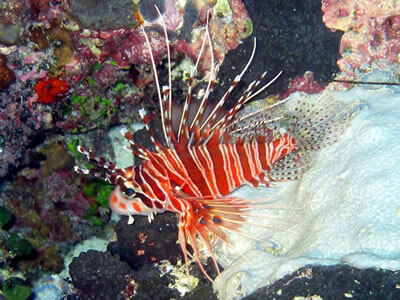 Rob captured this picture of a Spotfin Lionfish during a diving trip to Palau. Many thanks go out to Julia and Rob for such interesting photographs and for your interest in our newsletter. We really appreciate your valuable contributions. Each month we select a bug, wildflower and bird of the month. 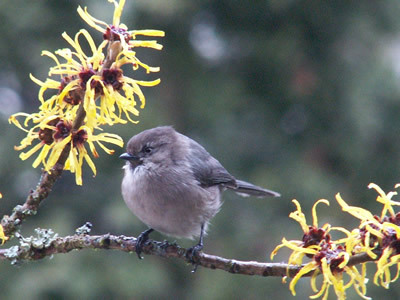 Here are this month's choices: Bug - Dichelonyx fulgida; Wildflower - Spring Gold; Bird - Northern Mockingbird. Our wondering image this month takes us along the Oregon Coast. 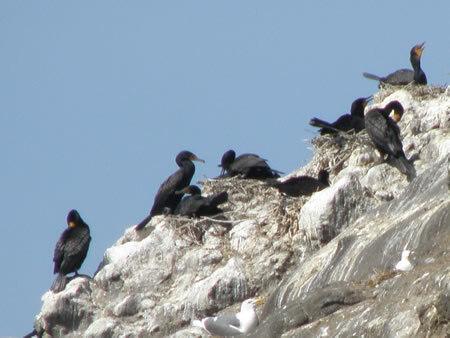 These Double-crested Commorants are all vying for a spot to nest here on Haystack Rock near Cannon Beach, OR. As you can see, they don't have a lot of room as each small spot is occupied. This is one of the many amazing and infactuating red rock formations found in Utah's Dixie National Forest. Erosion by wind and water has warn away the softer rocks leaving the harder ones. 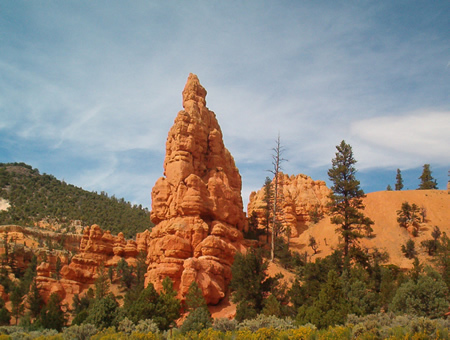 This photograph was taken in Red Canyon, a section of the scenic byway of Highway 12. Dixie National Forest is Utah's largest. 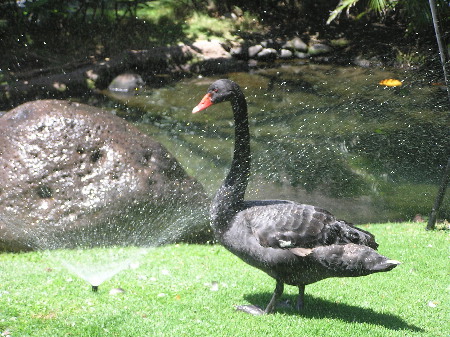 Once again we're looking for some interesting and humourous captions to go with this month's selection of a Black Swan wondering through the gardens of a hotel in Hawaii. Number one: "Just a quick shower before I go in the pool." Number two: "Hey! Who turned this thing on?" Bog Laurel has the scientific name Kalmia polifolia. 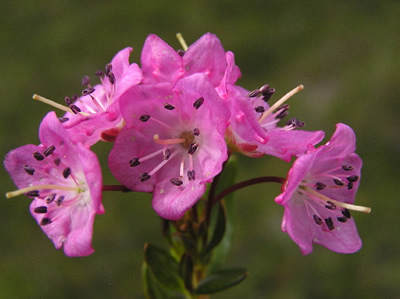 Organisms have often been named in honour of people for one reason or another and this is the case with the Kalmia part of the name. It honours Pater Kalm, an 18th century Swedish naturalist. The genus part of the name, polifolia, is derived from the Greek word polus meaning "many" and the Latin word folium = "leaf." This results in "many-leaved." Of course none of this helps us understand the common name which is believed to refer to the fact that this plant likes wet, boggy areas and the leaves reminds one of laurel or bay leaves. A mother returned from the grocery store and unpacked her groceries. Her son pulled out the box of animal-shaped crackers he had begged for and ripped it open. Strangely, he then started to spread all of the crackers over the kitchen counter. "The box says you can't eat them if the seal is broken," he explained. 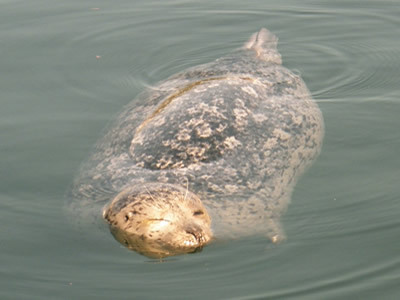 "I'm looking for the seal." "Some mothers do have 'em." In an earlier issue we mentioned that using small branches or twigs can be helpful in getting you that perfect, natural-looking shot of birds which are visiting your feeding station. 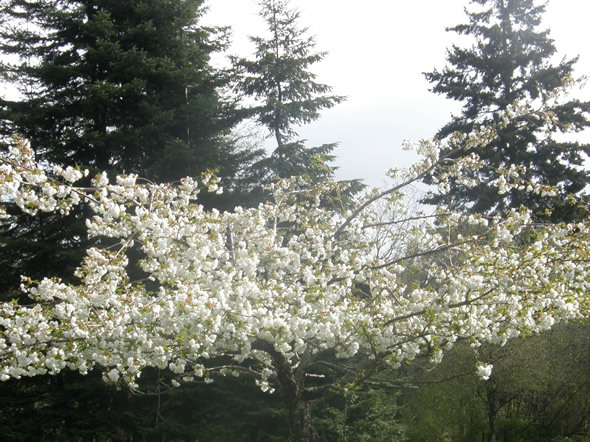 We've also suggested placing a flowering branch near a food source. 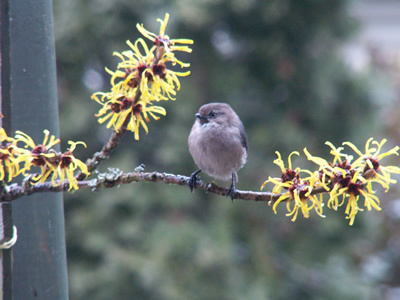 Here a flowering twig is attached to a railing and a Bushtit waits to move onto the feeder. This technique gives you the opportunity to zoom in and get a great image. Watch out for a special bulletin announcing and inviting you take part in our 2nd Annual Earth Day Celebration. Get those camera batteries charged up! 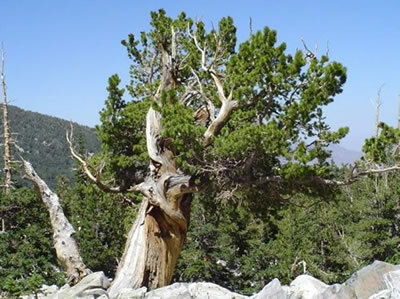 Did you know that The Great Basin Bristlecone Pine, Pinus longaeva, is the oldest tree in North America? Some species are over 5,000 years old! Often appearing dead and gnarled, in reality it's a tough survivor and one of the most fascinating trees in North America. Living at harsh elevations of over 5,000 ft/1500 m, the Bristlecone Pine is a hardy, slow-growing plant. In some environments it can take 700 years to grow just three feet. You'll find them in high mountains areas of the American Southwest deserts, especially Great Basin National Park in eastern Nevada. pages with photographs and interesting information. 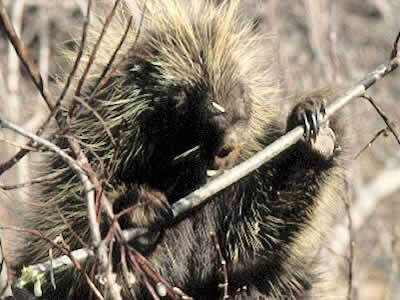 The word Porcupine comes from the French meaning spiny pig. 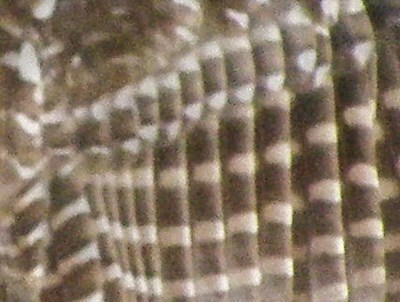 Our cropped close-up was off the feathers of a Barred Owl. Be sure to visit our Bird's Nest Loungefor a variety of pages about birds. Until next time, best wishes from your friends at the Dereila Nature Inn - the Cyber Nature Centre for Nature Lovers. Watch for the next issue of Whispers in your inbox during the first week of May.